Get two products in one with our ultra-absorbent Thirsty Yoga Strap that also doubles as a towel. Made from the same material as our Thirsty Yoga Towels, this strap is absorbent and hypoallergenic. Compact and lightweight, slide the microfiber strap around your feet, thighs or back to achieve binds and deepen stretches. Each end has an easy-grip hand opening for greater nonslip control even during hot yoga. Fast-drying. 78% polyester, 22% nylon. Machine wash. Made in China. 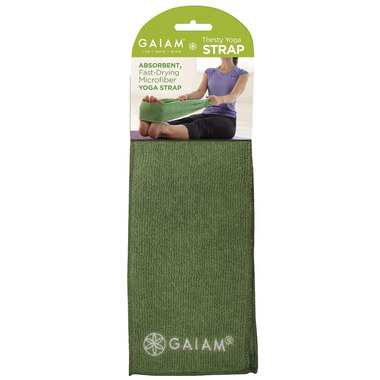 2-in-1 strap and towel combination, ultra-absorbent microfiber keeps you dry, Stitched-in loops for easy grip, achieve difficult binds and deeper stretches, made exclusively by Gaiam. This is a great combo of absorbent towel and yoga strap - the width and softness makes putting it behind your thigh for glute stretches much more comfortable than a regular strap. Really useful, a must have!